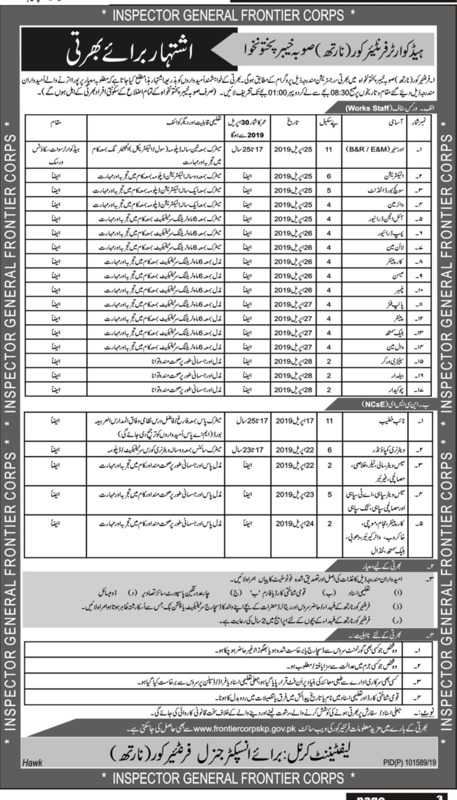 Jobs Description: Frontier Corps Jobs March 2019 are listed below in our site. Frontier Corps (North) Province Khyber Pakhtunkhwa recently announced an advertisement for Jobs of Orsihar, Electrician, Switch Board Attendant, Wire Man, Oil Engine Driver, Pump Driver, Line Man, Carpenter, Meason, Plumber, Pipe Fitter, Painter, Black Smith, Wall Man, Sanitary Worker, Baildar, Chowkidar, Naib Khateeb,Veterinary Compounder, Mess Waiter, and Sweeper. Frontier Corps Khyber Pakhtunkhwa has required the applications for the following jobs. How To Apply: Visit the Frontier Corps KP official website for more details.